A Cliftonville escape room has expanded – and plans to take its games on to the streets this Summer. Ctrl Alt Esc,based at the former Golden Dragon takeaway in Cliff Terrace, was opened in 2017 and is run by Thanet family team Laura Portanier, and fiancé Colin Taylor, from Minster, his aunt and uncle Marie and Geoff Musselbrook, from Margate, and their son and his wife Tony and Katie. The group have expanded the business into the next-door building and the first of two new rooms has been created. Detention features a mix of all the favourite elements from existing rooms Frankenscape and Spacescape as it challenges visitors to break free of the classroom. The team use Geoff’s computer know-how to bring something new to the escape room experience. 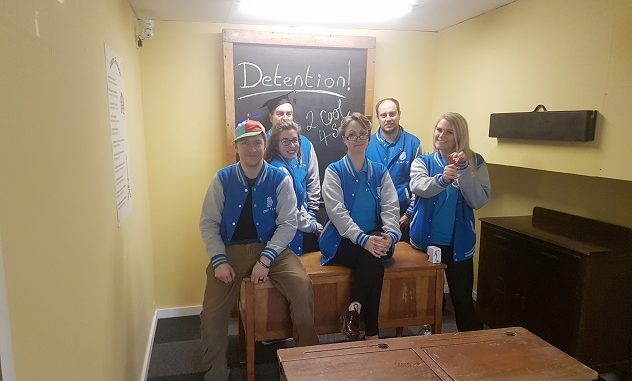 The games are computer based, using electronic systems to create a wider variety and more challenging, yet entertaining, escape game although there are also a few ‘traditional’ padlocks in the Detention room. This Summer will also see the introduction of Ghosts on the Go where participants will receive clues and challenges via tablets at different points across Margate to find the haunted soul and solve the tale. Laura said: “We always wanted to do some sort of treasure hunt. “We wanted something in keeping with the area with stories built into the background of Margate. It is family-based, so young children can join in and so can grandma. It gets people active and they get to see Margate. It will be so much fun. “We wanted to create stories that are built into the background of Margate, so you might find a ghost wandering around the Winter Gardens.